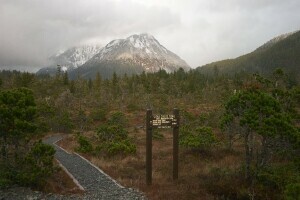 Sitka Cross Trail was built by Sitka Trail Works to provide people trail access from one end of town to the other. One terminus is at Indian River Trail and the other at the Gavan Subdivision residential area over 2 miles distant. Along the way it intersects Gavan Hill Trail and provides access to Sitka High School and the landfill softball fields. It is a popular trail for joggers and hikers. Between Indian River and Gavan Hill the overall trend is gradually uphill with a few short sections of stairs where the uphill slope is a little more noticable. Between Gavan Hill and the high school, there are several short uphill and downhill segments, although none are particularly steep. Between the high school and the Gavan subdivision, the trail goes steadily uphill. Most intersections have signs indicating directions and distances. Construction on the trail was finished in the late 1990’s and it gets a fair amount of regular trail maintenance. The portion of the trail from the high school to the Gavan subdivision appears to be an old gravel road that is overgrown to give it the feel of an extra wide trail. This section in very good condition. The portion of the trail between Indian River and the high school is typical of maintained hiking trails in this area, with many tree roots, and places with shallow mud and/or puddles. This section is in good condition. Given the amount amount of foot traffic this trail receives, packed snow and ice could make it slippery at times in the winter. There are a number of access points, including Indian River Trail, Gavan Hill Trail and the end of Charteris Street. Variety of different types habitats including muskeg, old second growth, and some alder forest. Wildflowers bloom in the muskeg from late spring to late summer.